EASY SELF-STUDY BAIL CE. Just read about the blunders made by other bail agents and the correct action they should have taken and take a simple open book quiz. Answers can be mailed, emailed or faxed back. You keep the books! SAME DAY CERTIFICATE! 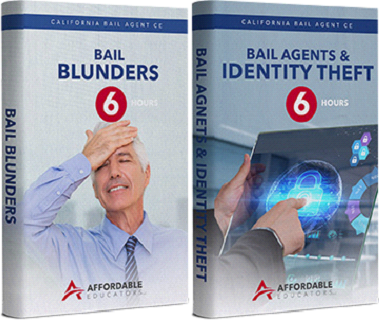 SEE BAIL BUNDLE BELOW TO BUY BOTH BAIL BLUNDERS & IDENTITY THEFT AT A SPECIAL PRICE. EASY SELF-STUDY BAIL CE. 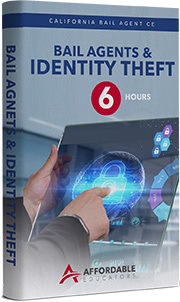 Just read about methods to protect customer privacy and collateral from identity theft and take a simple open book quiz. Answers can be mailed, emailed or faxed back. SAME DAY CERTIFICATE! 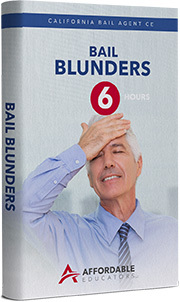 SEE BAIL BUNDLE BELOW TO GET BAIL BLUNDERS & IDENTITY THEFT AT A SPECIAL PRICE. Get BOTH the Identity Theft and Bail Blunder Courses . . . a total of 12 CE hours for just $85 including shipping.